Since we couldn’t use the wood from Pioneer Millworks, we drove down to Tacoma this morning to visit Rhine Demolition, a stockpiler of reclaimed wood to look for a replacement. 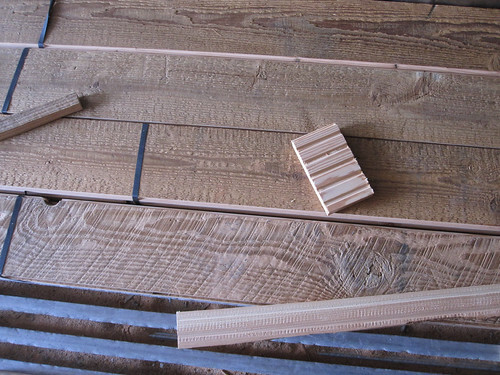 We quickly found some Douglas Fir planks that looked like the wood we wanted to use, but this was all very uniform, rather than the random stuff Pioneer Millworks sent. Better yet, it is reclaimed wood from the old Rainier Cold Storage Stock House that was partially demolished in 2008. That building was part of the brewery built by Andrew Hemrich, the founder of Seattle Brewing & Malting Company (that we photo’d in February) and the builder and original owner of our house. Months ago, while looking in an antique shop in Georgetown, I told Gay it’d be great if we could find something from the old brewery to put in the house. We finally did. We’re also going to get some bigger pieces of wood to build our basement bar top and possibly our dining table and office desks. The history is coming full circle; I think Andrew Hemrich would be happy. On our way to the house, we stopped at 99 Bottles, a beer store I’ve been meaning to visit for a year or two, but never find myself in Federal Way. It’s a nice shop, similar to my favorite Beer Junction in West Seattle, with a great selection and friendly owners. I got beers for the fridge and some cold beers to bring to the guys at the house for Friday beers. After a diaper change for Eva and a stop at Starbucks for a quick lunch, we trekked back up to Seattle. I met a new Schuchart/Dow guy, Tim the Tool Guy (he loves old tools and buys and restores them to working condition), who was there finishing up the trim around windows. The floor sub-contractor started installing the Ipê wood in the family room this morning and were just about finished when we arrived, the sauna arrived this morning unexpectedly a week early, most of the security cameras have been installed, Gay’s closet cabinetry is mostly installed (she’s excited! ), they built the woodwork around the opening between the kitchen and dining room which replicates the original woodwork and the steel frame for the wall in the attic is done and waiting for the track system to arrive and be installed next week. We had beers with the guys and admired the new wood floor in the family room that just looks great. I’m really happy with how that turned out, even better than I was expecting. We looked at a sample of the grout in the kitchen floor. The interior designers, when asked to select a color from two big palettes of grout colors, couldn’t find one they liked so they asked to mix two colors. And the colors are from two different grout manufacturers. The tile guys did it, but they keep telling us that it’s not a good idea to mix grout from two different manufacturers. I think they’re right, so we should pick a single color. There’s a couple colors that look just fine to me, but that’s why I’m not an interior designer, I guess. Nancy and My also requested a bunch more colors for the living room. They just can’t find a color they like that brings out the color in the wood in that room. Again, I look at all those samples and am glad I don’t have to pick colors. I feel bad for the painting contractor having to keep coming back and putting yet more samples on the walls. We called in dinner takeout at Kokoras, missed the 4:40p ferry but caught the 5p ferry back home.